“Us, Europeans, with all our concepts could not reach what Muhammad has reached, and no one will be able to precede him. I have looked in the history of humanity for an example and found that it was Muhammad, as the truth must be revealed. Indeed, Muhammad succeeded to subdue the entire world to monotheism”. THE BASIC PROCESS OF THE FORMATION OF THE UNIVERSE AND THE RESULTING COMPOSITION OF THE WORLDS. The Qur’an presents in two verses a brief synthesis of the phenomena that constituted the basic process of the formation of the Universe. We shall come back to the aquatic origins of life and examine them along with other biological problems raised by the Qur’an. The important things to remember at present are the following. b) The reference to a separation process (fatq) of an primary single mass whose elements were initially fused together (ratq). It must be noted that in Arabic ‘fatq’ is the action of breaking, diffusing, separating, and that ‘ratq’ is the action of fusing or binding together elements to make a homogenous whole 101. –sura 78, verse 12: “We have built above you seven strong (heavens) and placed a blazing lamp.” Here the blazing lamp is the Sun. The commentators on the Qur’an are in agreement on all these verses: the number 7 means no more than plurality. There are therefore many Heavens and Earths, and it comes as no small surprise to the reader of the Qur’an to find that earths such as our own may be found in the Universe, a fact that has not yet been verified by man in our time. Verse 12 of sura 65 does however predict the following: “God is the One Who created seven heavens and of the earth (ard) a similar number. The Command descends among them so that you know that God has power over all things and comprehends all things in His knowledge.” 102 Since 7 indicates an indefinite plurality (as we have seen), it is possible to conclude that the Qur’anic text clearly indicates the existence of more than one single Earth, our own Earth (ard); there are others like it in the Universe. Another observation which may surprise the Twentieth century reader of the Qur’an is the fact that verses refer to three groups of things created, i.e. –sura 50, verse 38: “We created the heavens, the earth .and what is between them in six periods, and no weariness touched Us.” The reference in the Qur’an to ‘what is between the Heavens and the Earth’ is again to be found in the following verses: sura 21, verse 16; sura 44, verses 7 and 38 ; sura 78, verse 37; sura 15, verse 85; sura 46, verse 3; sura 43, Verse 85. This Creation outside the Heavens and outside the Earth, mentioned several times, is a priori difficult to imagine. To understand these verses, reference must be made to the most recent human observations on the existence of cosmic extra-galactic material and one must indeed go back to ideas established by contemporary science on the formation of the Universe, starting with the simplest and proceeding to the most complex. 1) Existence of six periods for the Creation in general. 2) Interlocking of stages in the Creation of the Heavens and the Earth. 4) Plurality of the Heavens and of the Earths. 5) Existence of an intermediary creation ‘between the Heavens and the Earth’………. Miracle of QURAN 1400 years back still stands. For example, Mediterranean sea water is warm, saline and less dense, compared to Atlantic ocean water. When Mediterranean sea water enters the Atlantic over the Gibraltar sill, it moves several hundred kilometers into the Atlantic at a depth of about 1,000 meters with its own warm, saline and less dense characteristics. The Mediterranean water stabilizes at this depth (Principles of Oceanography p. 93). The Mediterranean sea water as it enters the Atlantic over the Gibraltar sill with its own warm, saline and less dense characteristics, because of the barrier that distinguishes between them. Temperatures are in degrees Celsius (C). Even in depths (indicated here by darker colors) up to 1,400 meters and at distances ranging from a minus -100 to +2,500 meters, we find that both bodies of water maintain their individual temperatures and salinity. Although there are large waves, strong currents, and tides in these seas, they do not mix or transgress this barrier. The Holy Qur’an mentioned that there is a barrier between two seas that meet and that they do not transgress. But when the Qur’an speaks about the divider between fresh and salt water, it mentions the existence of “a forbidding partition” with the barrier. This information has been discovered only recently using advanced equipment to measure temperature, salinity, density, oxygen dissolubility, etc. The human eye cannot see the difference between the two seas that meet, rather the two seas appear to us as one homogeneous sea. Likewise the human eye cannot see the division of water in estuaries into the three kinds: the fresh water, the salt water, the partition (zone of separation). 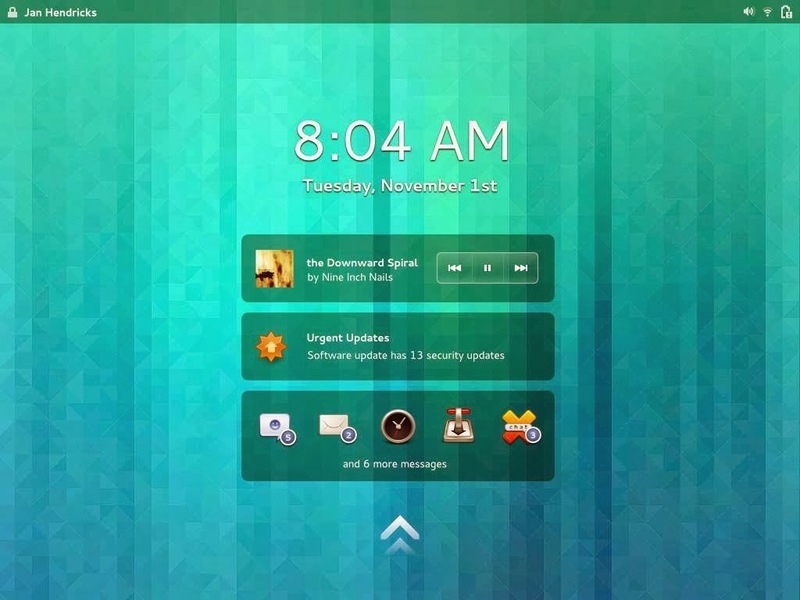 The new version of GNOME (GNOME 3.10) for the Ubuntu 13.10 distribution’s desktop was launched back in September. In general, the OS ships with the 3.8 version of the desktop, which is an alternative to the Unity desktop, but an older version. The new version adds a number of new features and apps to the distribution and it would be advisable to upgrade to it. 1. Firstly, you will need to add a GNOME 2 PPA to the Ubuntu Software Sources. You can do this using a graphical user interface but using the command line is the easier way. Open the terminal window and type in this command. 2. Now, to install the GNOME 3.10 desktop, you will need to type in the following command on the command line. 3. Next, you will want to install some of the extra stuff to the desktop. For extra apps like Weather, Maps and Music, you’ll need to add extra GNOME PPAs. To install the extras, use the following commands on the terminal.